What an incredible opportunity this year brings. One of the strongest messages coming through is for each of us to focus on what we are wanting. Yet, if we really self-reflect and look at where we might be placing most of our energy and thoughts we may see that what we really may be doing is letting our minds run like a hamster wheel over and over in the same place. The angels say more often than not it has an underlying tone of fear. Michael Bernard Beckwith says, “ You can’t hide your secret thoughts, because they show up as your life!” Wow, think about that for a moment. I love that quote. So, if your life has some areas that you are not exactly pleased with, this is a great time begin to take notice. Don’t judge it, but set an intention to welcome positive change. Ask the angels to help you get more conscious to those moments and begin replacing those thoughts or words or actions with more loving ones. One of the fastest ways I have seen anyone heal anything is when they ask for Heavenly assistance. Archangel Michael wants you to know that he is a master at removing fear and the toxins that dwell within us because of staying in this lower vibration. He is fantastic at helping us with the courage to do that which we may think we cannot. 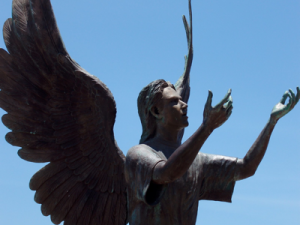 Archangel Metatron would be honored to what he says is to help us “deliver the goods”…which translates to helping us with our areas of procrastination which he says are delay tactics of the ego that delay our good. Generally speaking it is around your Divine Life purpose. accomplished, but the time in which it happened was magical. Metatron can “re-negotiate time for us” and truly that is what happened today. As I think about today, I am reminded as to how magical life is when we work with the angels and the Spirit realm. I invite you to bring the angels into your life more and more each day…we have an opening energetically this year in which to really make things happen. We can have fun doing it too! The angels can be so funny…they make me laugh out loud sometimes and shake my head in amazement. It is the angels pleasure to be of service to us so that we can be of service to ourselves and each other. Decide what you want, focus on what you want and ask the angels to help you…then watch the magic happen as the angels inspire you to blossom into more than you thought possible! All really is well…you are loved, you are worthy and your Light is needed to shine bigger and brighter than ever before. Blessings on your New Year and your New Beginnings!! !